So, we're not big vacation photo people. Here are almost all of the pictures taken for our 3-day vacation. There are 6. And these were all taken at the zoo. For the first day of our trip, we went to see a triple-A baseball game. This is the stage right before the majors. The stadium was nice, although we were right in the sun in the middle of the day. We kept the boys pretty covered with sunblock and hats. Somehow, none of us got sunburned. We lasted until the end of the 7th inning. It helped that they had a little playground area at the stadium. We took the boys to the playground during the 5th inning. The home team was losing when we left, but it helped Little Elvis to see so many players strike out, and not cry about it. After that, we went swimming in the hotel pool. It was a full day. Sleep was a little rough, but that's to be expected when you take three little ones out of their schedule. For the second day, we went to the zoo. This is a rare (although not as rare) Baby Plum fit. He wanted to climb up and play on the concrete animals. I usually let him do that. This time I saw the sign that said not to do that. He perked up at the sight of this tortoise crawling around. One of the zookeepers had this little guy out for kids to watch. She also brought out a lizard while we were there. And another woman brought out a snake. Little Elvis got to touch the lizard and the snake, but after a split-second touch, he wanted hand sanitizer so he could move onto the next big thing. We looked at lions, snakes, pelicans, birds, panda bears, and seals. These were requested by the older boys. But they're more into getting onto the next big thing right now. They spent the most time at the playground. Little Elvis brought "Pandy" to see the pandas. Pandy needs a bath after this trip. Cheese Puff was very willing to be along for the ride. He did a great job riding in the stroller and car seat like he did. He wants to crawl and walk right now. But he handled sitting very well. After the zoo, we ate some lunch and headed for a museum. It's hard to read or learn anything at museums right now, since Little Elvis and Baby Plum want to run on and see what the next big thing will be around the corner. We did learn some interesting facts about Model Ts, which was good. Little Elvis is quite the questioner these days. He's asked questions about the Model T, and some of them were finally answered. We got up early the next morning, and headed back home to make an appointment. I think the boys had fun, and it went very well. I think our first real "family" vacation was a success. We just got home from our first official family vacation. It was to the "big city" near us. It was fun, and went pretty well. I have not put the pictures or video into the computer. But, the two older boys went with my parents before we started our vacation. And poor Baby Plum had too much fun! 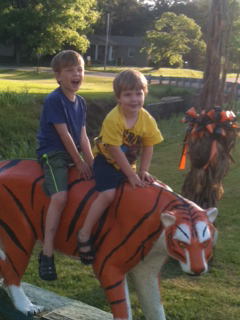 Here he is riding a tiger. I assume Little Elvis is roaring. But I'm not sure. I know they fished, and Baby Plum's getting into that. He likes to reel in the catch. He still doesn't like to eat fish, though Little Elvis doesn't like to bother with fishing, but he loves to eat fish. They are such a perfect little pair. 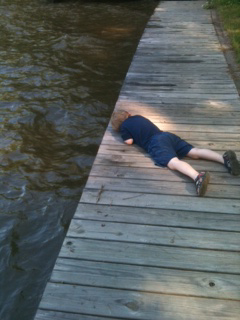 After fishing, the boys slept. ButLittle Elvis doesn't need as much sleep as his 3 year old brother. So, Baby Plum must have been tired the next morning. This happened once we all met up that afternoon. 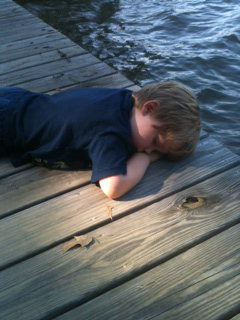 Poor Baby Plum was so tired that he fell asleep on the dock while his Daddy fished beside him. You know he has to be tired. Especially considering that the neighbors were having a party. He's a very mobile sleeper, so I sat beside him and read until supper time. Sweet little boy. With Daddy around, I don't get too much one-on-one time. I'll take it, even if he is sleeping. It's taken me long enough, but I've finally put together a video of Cheese Puff. He's really starting to walk now, and he's talking some. The video is more about his walking than his talking, although you can hear him saying, "Cheese!" in just about every edit. He knows how to mug for the camera. He's not quite ready to walk all of the time, but he's walking more and more, and he's very proud of himself for this accomplishment. Cheese Puff is getting ready to walk! He turns 15 months tomorrow. I guess we have slower walkers in our family. Baby Plum didn't walk until 15 1/2 months. I must carry them too much. I had taken one of the cushions off the couch, and Cheese Puff was so proud of himself. He got up there all by himself. See him telling Baby Plum to look at his accomplishment? Cheese Puff loves couches. He tried riding a little scooter on Mother's Day. He liked it alright. 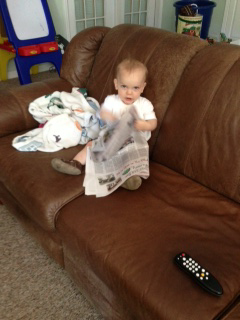 But he liked shredding the paper more. I left coupons on the coffee table on Sunday, and he made a huge mess! The living room was covered with sheets of paper. Here's the big stuff. He's standing up here. He can get to a stand from the floor. He prefers that to pulling up on something and letting go. He likes to applaud himself when he stands. He had to re-balance for a second. 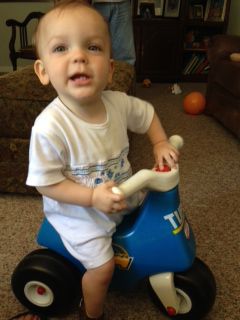 Here he was cruising along the furniture, and pulling his hands up to show me "no hands!" When I brought out the camera, he decided to say "Cheese!" instead. And give me a kiss. He leans in and says "mmmm" when he wants a kiss. Can't say no to that. We have video of him walking. I will try to get it edited. I just need to put a video of him up. Poor third baby. Little Elvis gets out of school Wednesday. The school didn't have a graduation. No schools in the area did. But he went to one anyway. Because of his best friend from last year, who is in a different school district. That friend's mom decided that they needed a graduation. So, Little Elvis went to a "graduation ceremony" on Friday with his best friend's class. So, a whole bunch of kids from a different school district and Little Elvis. Didn't bother him. They were all supposed to read parts of a little poem. Little Elvis was the only one anybody could hear. He got his own gown and mortar board. Standing with a bunch of kids he doesn't know. Bob played "You are my Sunshine." Baby Plum is Bob's shadow. Getting his diploma. My mom got a video. His diploma says he graduated from the other class. It will be a funny story when he's older. Bob played "Pomp and Circumstance" on the accordion. Saying part of another speech. Once the ceremony was over, he took my camera and took lots of pictures of items and people we didn't know. He also shot a video of all of the kids running around. This was one of the only pictures that didn't get deleted. We are so thankful that we don't a film camera. He did a good job. And he's getting more mature in many areas. He still cries over absolutely nothing, and we are working on it. We have some things that are kind of working. But he's getting tougher. He's still sweet, and very affectionate. He's also super smart, and the incessant questions are getting to us. I need to learn a whole lot about electronics companies. A whole lot. Baby Plum had his classroom end-of-the-year performance last week. Little Elvis didn't sing at his, but I thought Baby Plum would. He did. A little. He did some of the steps as well. It was cute. He also shrugged his shoulders a lot. We've never seen him do it. His teacher said he did that right before he started talking more in class. But he hasn't done it that we've noticed since. Baby Plum has also dramatically slowed on the thumb-sucking front. He didn't do it that we noticed this weekend, but he did some today. As the thumb-sucking slowed, the (previously accomplished) potty-training has gone back considerably. Maybe they are linked? 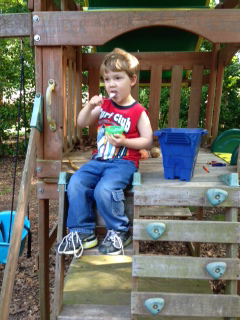 He wanted to eat cottage cheese on Sunday afternoon. And he needed me to take a picture of it. My mom took one as well. Little Elvis had to jump in as well, although he didn't try any of the cottage cheese. We decided to make little postcards that say "That's a Wrap!" for Baby Plum's teacher gifts. I like this look, but he's biting his lip instead of really smiling. He does this some, and it's cute. This look is a Bob look. Bob does the same thing around bright lights. Bob never hears that Baby Plum looks like him, but in this picture, he does. Little Elvis also does this expression some. I love this smile, but you can't see the clapboard. I think one of the cats was distracting him here. This was our winning shot. I hope the teachers don't think the "That's a Wrap!" is crass. We're doing a movie-themed gift, and thought it would be cute. 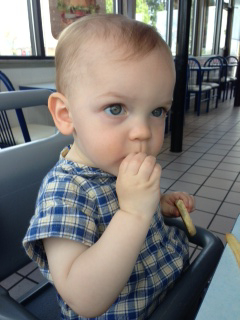 My parents took him to visit my maternal grandparents on Saturday. 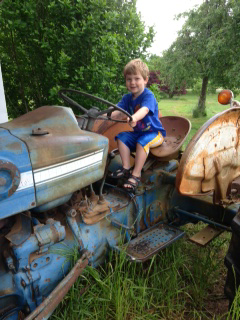 He liked sitting on the tractor. He still loves having his picture taken. Baby Plum has decided to take his "little helper" role seriously, and has enjoyed helping us do projects around the house. He helped spray paint some this weekend, and helped me bake cookies this afternoon. He throws stuff away, will get things for Cheese Puff, and helps with checkout at grocery stores. He's also suffering really badly with allergies right now. I'm wondering if the stuffy nose might be part of why he's not sucking his thumb as much. He needs to mouth breathe right now. Sometimes, the brothers do some silly things. Someone put a heart sticker on Cheese Puff while he enjoyed a meal. If I had to guess, I would say Baby Plum did that. It's nice that it was a heart. Maybe because he loves his baby brother? He does like riding in our bike trailer/stroller with Cheese Puff. We have two double strollers, and this one is much lighter. Pictures of all three boys smiling sweetly are very difficult to come by. With two, it's not a problem. Look at them in their matching "Big Bro" shirts! This was our best option. You can't really see the "little brother" on Cheese Puff's outfit, but it's there. They all three have matching outfits! It took me seven shots to get a Happy Mother's Day picture for my mom. This was the best I got. The signs say "Happy" and "Day." Cheese Puff didn't want to hold his up, so he balled it up instead. Little Elvis drew Angry Birds all over his. His eyes were open, and looked nice in the other shots. But we decided to go with a picture where at least two of them were looking at the camera. I was worried that our big blue-eyed baby was going to be content to (very quickly!) crawl his way through toddlerhood. But he's getting ready to start walking. He's taking 1-2 steps between Bob and me, and certain pieces of furniture. Last night, he was pulling both hands off the couch and grinning a big "Look at me!" smile. He stopped when I brought out the camera. He just smiled and said "Cheese! MaMa!" That's what he says to the camera. Silly boy. He's also saying "Wah-Wah" when he wants to walk while we hold one of his hands. It's fun knowing what goes on in his little head. He thinks about balls a lot. Doors a good bit. And playing Duck, duck, goose some as well. Baby Plum isn't very much of an artist. He's a minimalist, just like his older brother was. But, he's decided that I am a prolific artist. We've brought out the sidewalk chalk since the weather's been nice. He's had me draw blue lions and parrots. I always start out drawing a sun and clouds, because those are easy. I'm also fairly confident in my fish. But he's currently into "The Lion King" and Zazu the parrot is his favorite character. Did you know that Mr. Bean was the voice of Zazu? I didn't, until this weekend. Anyway, last weekend, he wanted to play with playdough. He's just like Little Elvis with this as well. By "playing" with playdough, he means that he wants me to make him something. His request that day? A horse! This is what he ended up with. I think it's pretty good for someone who is not artistic. The tail, one leg and an ear fell off right after I took this picture. He was over it by then anyway. We are still having problems with Cheese Puff and throwing up. It's been going on for a while now, and while it did get better, it's come back. We don't know what is causing it, and that's very frustrating. The doctor's office isn't much help. He still eats well, he's obviously getting nutrition, because we have to change lots of diapers each day, and he's gaining weight. The throwing up used to not bother him. But I think my reaction to it causes him to cry. I'm kind of over the throwing up all over me. And I usually yelp when it happens, because it's gross and stinky. And instead of immediate cuddling, I go into clean-up mode. 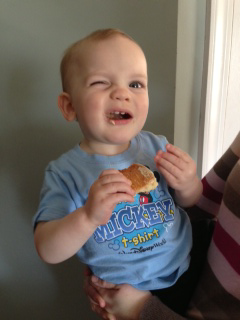 We thought he might be lactose intolerant, because the child hates milk and yogurt. But he likes cheese. Tonight, he threw up after eating cheese. But he's been eating cheese this week. He really likes mozzarella shreds. He also really liked spaghetti this week. At least one of my children didn't fuss when presented with this meal. His brothers have to be forced to eat "red sauce." Cheese Puff is teething. He's drooling and has a super-runny nose because of this. Each throw up episode is preceded by some pretty intense coughing. I'm hoping that's what's causing this. It doesn't help that Baby Plum had another stomach bug this week. So, it's possible that Cheese Puff caught that again. Luckily, Little Elvis didn't get it. The throwing up isn't stopping his vocabulary. This baby is such a chatty boy! He adds words and sounds all the time. I'm going to be a total dork, and put up the list. We're loving being able to communicate with him this early. He's still not walking, although he's crawling super-fast these days. And he's climbing. On anything he can get his knees on. He's going to be scarier than Baby Plum.